Also referred to as personnel lift. Designed to meet the work at height regulations by providing a safe low level access platform. 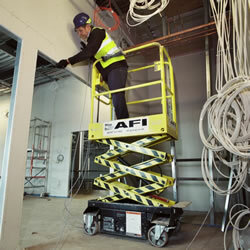 Wilson Access are part of the AFI group of companies, the UK's leading Powered Access Hire Specialists. Truck and Track Mount Machines, Cherry Pickers, Scissor Lifts, PAVs and Mast Lifts available for hire UK wide.